The first time I ever made mussels, I was in college. It was my sophomore year and I was sharing a 2 bedroom/2 bathroom suite with three other girls in a building called The Dakota. I remember the name mostly because on parent's visitation day, one of the girl's father commented that our building was a "very famous" one and that he thought "someone famous once lived" there. I remember humoring him when he said this, even though I knew that he was really thinking of John Lennon's Dakota by Central Park, not our mid-century Washington, DC condo. He was one of those terrible dads who earlier that summer had used my roommate's social security number to get himself a credit card, but on that day, everyone was all smiles so I figured I ought not rock the boat. Of the four girls, I was the only one who ever really used the kitchen. My favorite roommate spent all her time with her boyfriend. The fourth roommate seemed to be perpetually going on or returning from overseas expeditions. And the other girl (the one with the deadbeat dad) stuck to an odd diet of Skippy peanut butter, white bread, and frozen vegetarian nuggets that she defrosted in the microwave. I was fine with this arrangement, which left me with a full kitchen (with dishwasher and trash disposal!) and fridge all to myself (except for the nuggets), and spent most of my days baking cakes, roasting chickens, and stirring large pots of risotto. I'd been cooking quite a bit since I was in high school, but until then I'd never really cooked any seafood by myself. Lately though, each time I went grocery shopping, I felt myself being drawn towards the large fresh seafood counter. It took me a while to work up the courage, but I finally did it; marching straight up to the counter one afternoon, I stared at the options trying to make a decision. Before I was ready, the fishmonger caught me by surprise, and in a panic I pointed to the first thing I saw: a bed of shiny blue-black mussels tied in little net sacks and piled like pebbles on the ice. "Can I have one of those?" I asked. He picked up a sack and swung it before me, "It's two pounds. That enough?" I nodded quickly and watched as wrapped them into a bundle of brown paper. I felt like a grown-up as I leaned over the counter to grab the package they way my mother always did. I was a grown-up lady, buying seafood at the supermarket. Back in my dorm that evening, I cleaned the mussels in the sink like I'd seen my mother do, scrubbing them with a wet paper towel and pulling off the little fuzzy beards that cling to the end. I heated my biggest pot and added half a bottle of white wine (purchased with my old fake ID, of course), a roughly chopped onion, a few garlic cloves, and a big handful of parsley. I then dropped the mussels in, wincing a bit as the pebbles hit the hard bottom with a clang, and slammed on the top. When my roommate came home a bit later she found me sitting alone at the table, book in hand with a glass of white wine and my giant plate of mussels. She fixed herself a peanut butter sandwich and joined me. Looking from my plate to her sandwich, she shook her head. "You're so much more mature than the rest of us!" "I'm not, " I replied, acknowledging the fact that I'd skipped class to go to the market. "I just have totally different priorities." 1. Scrub and debeard the mussels under cold water. Discard any that are cracked or which do not close completely after being touched. (If using frozen mussels, let thaw before rinsing and cooking.) Set aside. 2. In a large dutch oven or other heavy bottomed pot, heat 3 tablespoons o of olive oil over medium heat. Add the pieces of bacon and let cook until fat is rendered and bacon is crisp. 3. Add the shallots and garlic and saute until shallots are transluscent and garlic has just a hint of color (about 2-3 minutes). 5. 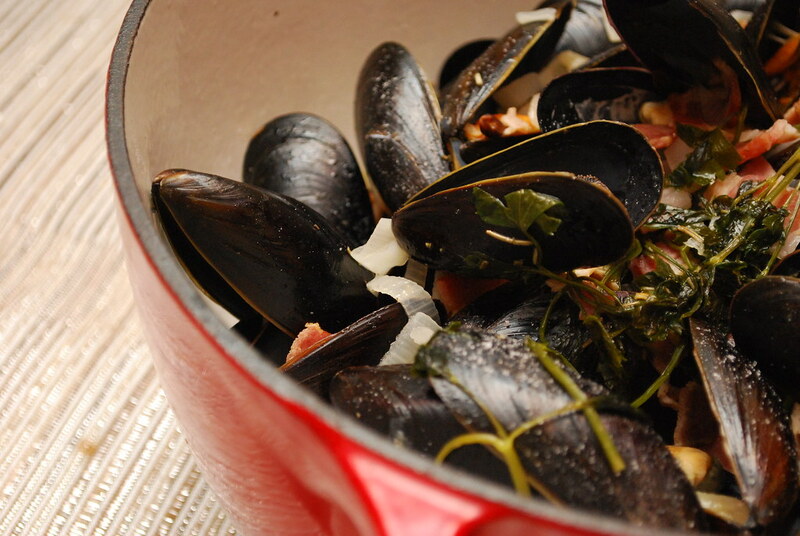 Use a slotted spoon to remove the mussels to a large bowl. 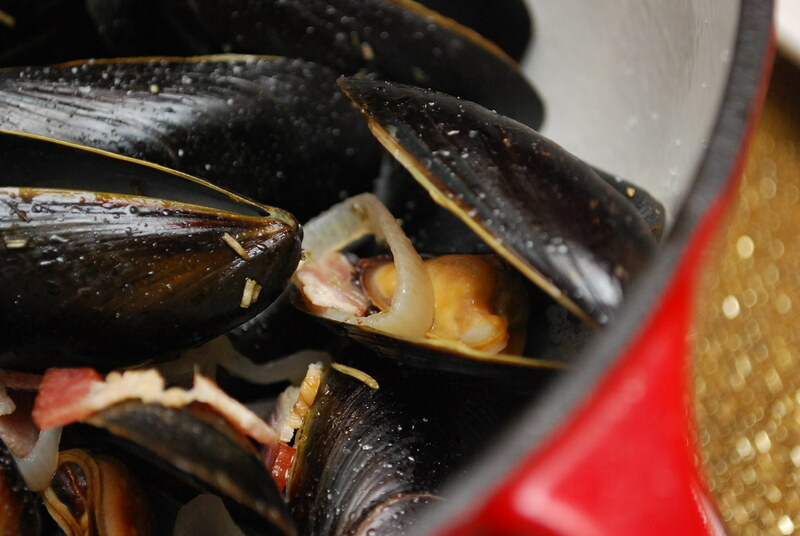 Discard any mussels that didn't open all the way during cooking. 6. Return the pot with the broth to the flame and whisk in the butter and parsley. Season with salt and pepper. Let simmer for 2-3 minutes until slightly reduced. Alejandro, I love the story telling in this post. I'm so glad I wasn't the only one cooking up a storm in college. I never quite made mussels, but I did make some interesting things. I've been itching to make mussels - I've never done so but I love all seafood - and I think this is the recipe I'm going to make. Sounds delicious, and bacon and wine make EVERYTHING better. 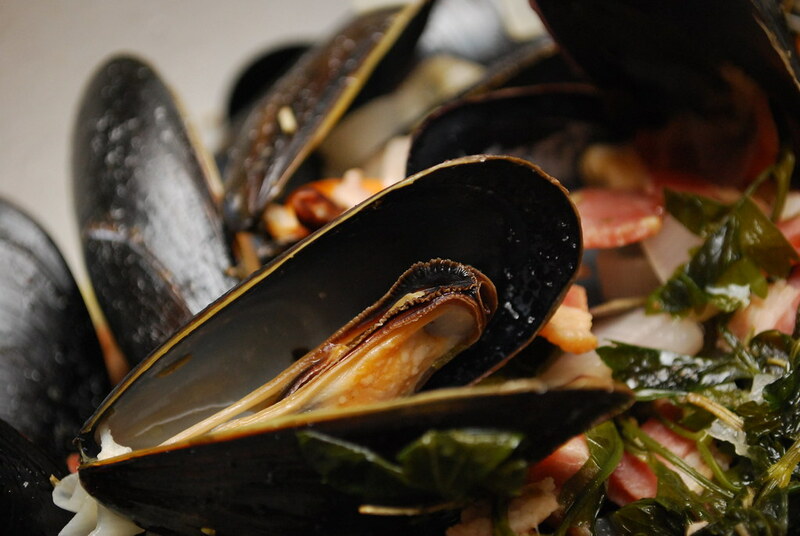 My husband would be all over these, mussels and bacon are two of his favorites. Me, not so much, I am not a seafood person, much to his dismay. I too had roommates that rarely cooked. One would only eat frozen boca burgers and they made our apartment stink. I also had a british roommate for most of a year who ate only bacon, pasta, and mayo mixed together. It was disgusting. He would also leave his dirty pots everywhere. I'm a sophomore in college right now and you literally just described me. Perfectly. Reading your blog in class right now, planning dinner. I have NO idea what the professor is talking about. So that's what I was supposed to use my fake id for in college?! Expanding my culinary horizons? Your roommate may have been right. : ) I loved this story and this recipe looks completely delicious. I'm a big fan of mussels and truth be told, I've never made them in my kitchen. I oughtta try! That story is adorable! I felt a lot like that through high school when I would cook for my family a few times a week and have beautiful leftovers for lunch while my classmates ate hot chips, fried chicken, ramen noodles and packet mac'n'cheese for lunch around me. Mussels with garlic, tomato and white wine was the first non vegetarian meal I cooked when I stopped being vegan - my first seafood in 6 years. 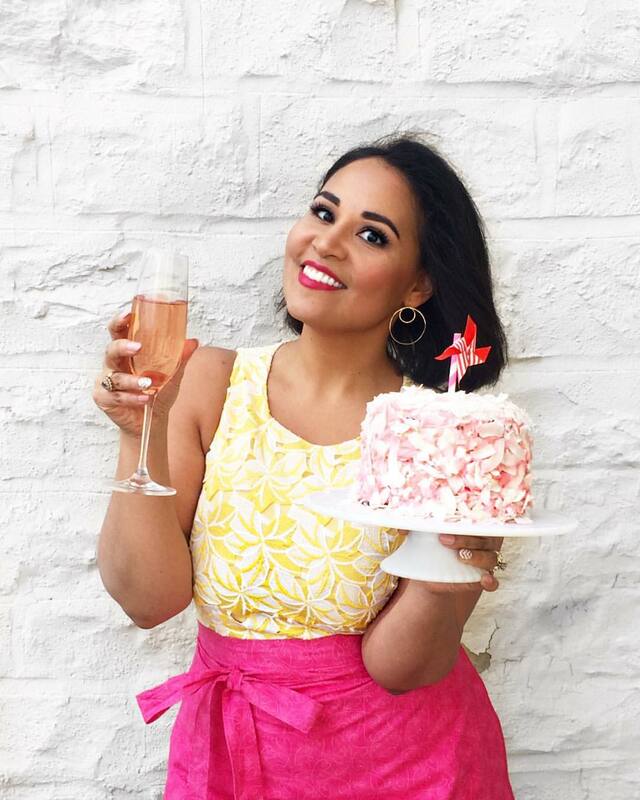 They are now a firm favourite of mine and I cannot wait to try this recipe, thank you! UMMM did you say bacon? YES, delicious. This looks incredible. Im so glad I stumbled upon your foodie blog. What would you recommend as a substitute for the bacon (if making for a guest who does not eat it)? Very well-written, and your photos are gorgeous! I've never cooked mussels before. I actually just had my first one a few days ago - in a campus cafeteria no less! They were surpisingly good... I'd like to try this recipe!